Two things about me: I like beer and I like high fantasy. So, believe me when I say I'm excited for tonight's premier of Game of Thrones season six. It doesn't matter too much if my favorite character seems to be down for the count, Tyrion is still alive and kicking, so I'll be sticking around until he goes or the series concludes (whichever comes first). What better way to kick off the start of the show's sixth season than with a special beer released in celebration of its fourth? 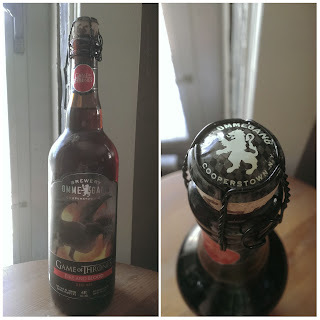 I know I could be drinking one of Brewery Ommegang's more recent GoT brews (such as Seven Kingdoms), but, I'm hoping, Fire and Blood will suffice. Brewery Ommegang hails from Cooperstown, NY. The Our Brewery page of Ommegang's website is overflowing with historical context, as befitting the official producer of GoT brews. Ommegang was started in 1997, on an old hop farm in what was, at one point, in the center of early America's hop production. Starting with its first in 2004, the brewery has won a slew of awards for its beers. The brewery's first Game of Thrones beer was Fire and Blood. The red ale, which was released in 2014, has an ABV of 6.8%, and, according to its official page, contains hints of fruit, spice, and rye throughout both its aroma and taste. Also, each bottle has one of Daenerys' dragons on the label. The one I'm about to drink features Drogon. I do get a small amount of spiciness from the beer's nose. However, it's much more fruity and florally. I'd be hard pressed to say I detect notes of specific fruits, but the ale's aroma is definitely inviting. 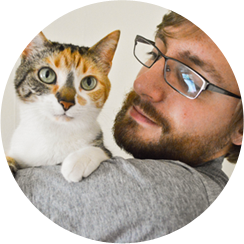 Purrl wasn't a huge fan of it, however. 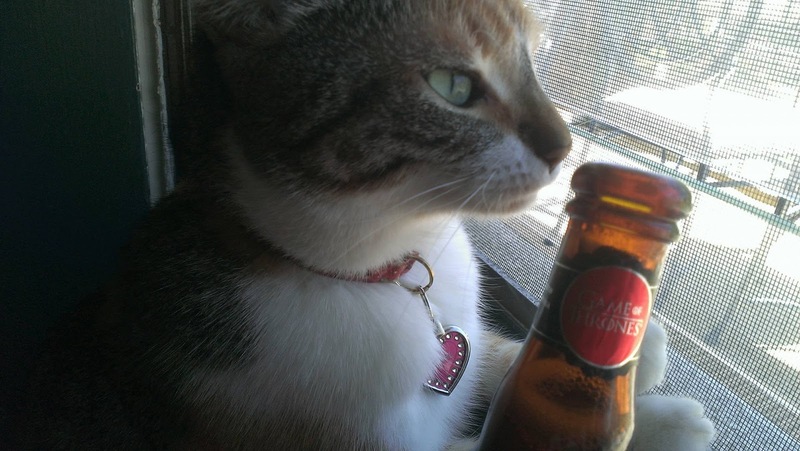 She gave the bottle four whiffs before wandering off to pursue other cat activities. There's abundant fruit and spice in the ale's flavor. It doesn't set your mouth on fire, but there's a notable amount of warmth to be found (I haven't mentioned this yet, but Fire and Blood is brewed with ancho chilies peppers). The rye is present here, as well. It provides a nice, earthy kick to the beer and serves as a nice balance to the mild spice. On the mouthfeel front, this is a hearty brew. Chewy, yet not unsuitable for hot summer days. The spice dances around on your tongue and in your cheeks. This, in my opinion, is the biggest draw of the ale. I largely read my A Song of Ice and Fire books in the summer. I step out onto my porch or balcony, unfold a beach chair, and settle down into the story. I always, always do this with a beer or cider at my side, like during my final summer in Athens, when my porch was just big enough to fit a chair. I would break into a Woodchuck Summertime (then just called Summer) and see what Jon Snow was up to beyond the wall, or how Tyrion's wit was saving him (or getting him into trouble) this time. I'd pass hours outside reading--largely due to the fact that I am an incredibly slow reader. I'm pleased to say that the time I passed in this way is exactly what Fire and Blood brings to mind. It's sweet and warm, just like those summer days in Athens. Brewery Ommegang's Fire and Blood is a good red ale. It's full of flavor and spice, without being overpowering. It's also housed in a damn cool bottle that will likely become a collector's item. I give it an 8.0/10. It doesn't knock my socks off, but drinking the ale is an enjoyable experience. Dany and company would be pleased.